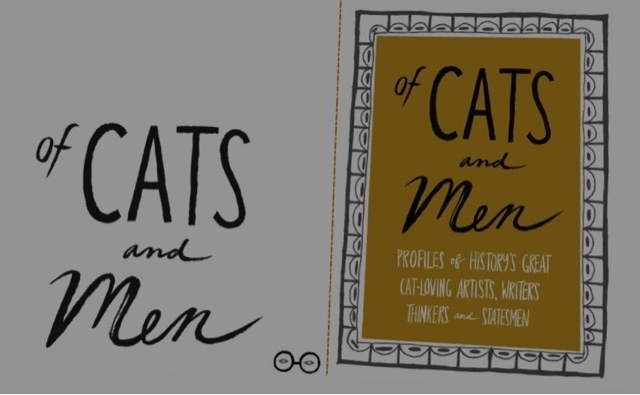 Of Cats and Men by Sam Kalda will delight cat lovers. Cats have always been an important part of my life. Kalda's book is centered on short articles on famous men from history that loved cats. Kalda is a professional illustrator and included are lots of great drawings of well known men and their cats. In America presidents demonstrate their masculinity by posing with the familly dog. Crazy cats ladies are stereotyped figures, not crazy cat men. One of Kalda's objectives is to debunk the notion that "real men don't love cats". Cats help to humanize exalted figures. To me Siamese Cats are the best. 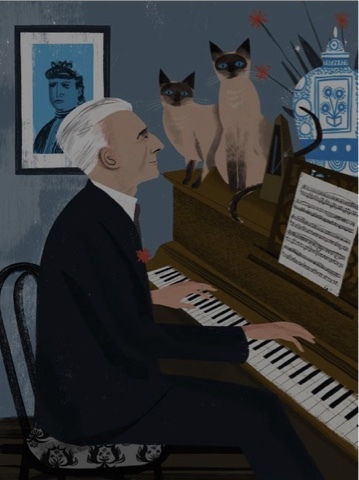 Kalda's drawing of the great composer Maurice Ravel especially delighted me. The cats reminded me of my very much missed Yoda and Mr. C.
Cats, not dogs, have been historically seen as the companions of Wizards. The scientific genius Nikola Telsa comes very close to a wizard. 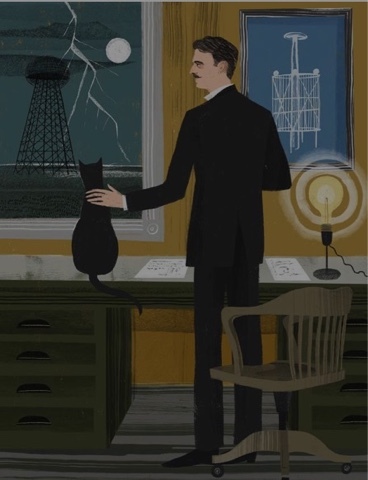 A cat played a big part in his discoveries about electricity. I think all cat lovers will totally enjoy Of Cats and Men by Sam Kalda. 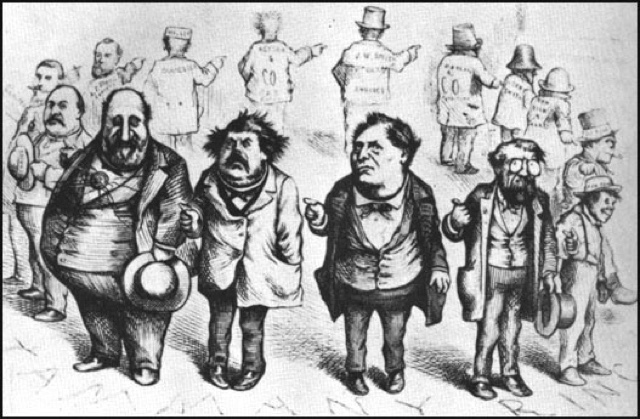 1840 to 1902, born in Germany, immigrated to America, staying In New York City, with his parents, Thomas Nast is considerd the father of American political cartooning. 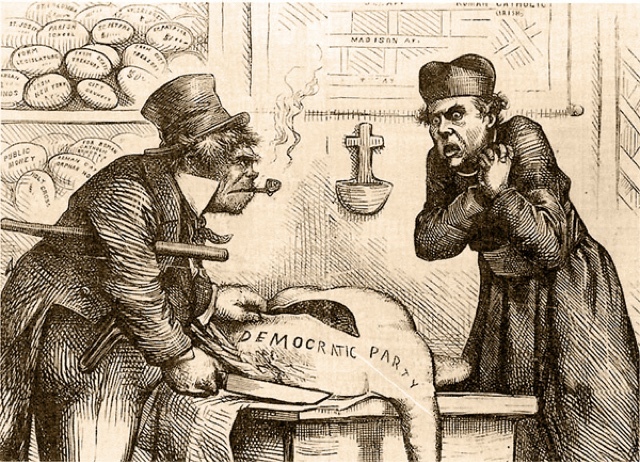 Before I read Thomas Nast Political Cartoonist by Lynda Pflueger at the very most I would perhaps recognized him as the creator of the post famous political cartoon in American history. 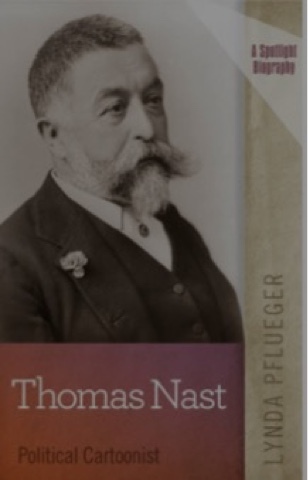 Pflueger starts her very well written biography with an account of the arrival of the Nast family in New York City. Nast was six at the time. Pflueger tells us about the times of the family getting settled in a new country. 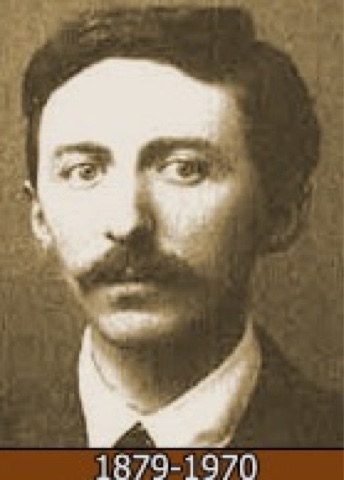 Nast attended public school from six to fourteen, he never did very well in school, being mainly interested in pursuing a career as an artist. Self portrait of Nash during a rough patch in his life. Right after the civil war. In 1854 he left public school and began two years of art instruction. 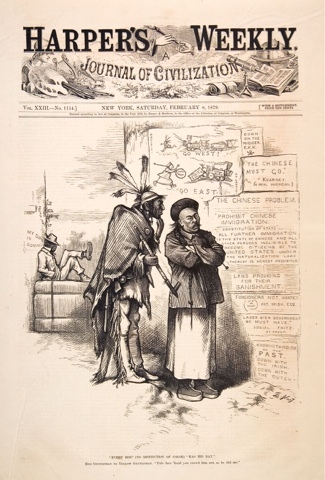 He got a job as a draftsman in 1856 and sold his first drawing to Harper's Weekly in 1859. He, as Pflueger details,was to have a long and mutually benifical relationship with the four Harper brothers. 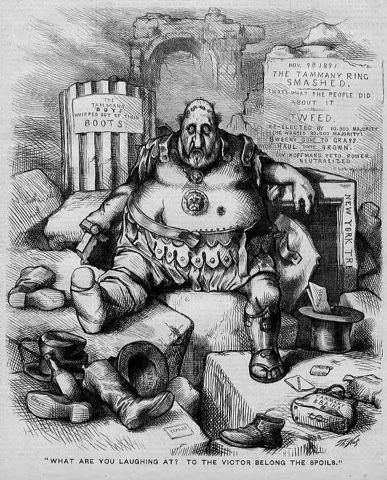 He began to regularly publish drawings in Harper's Weekly, many of them harshly critical of the very corrupt New York City political organization known as Tammany Hall, dominated by William "Boss" Tweed. I as fascinated to read about his time as a war correspondent in Italy. 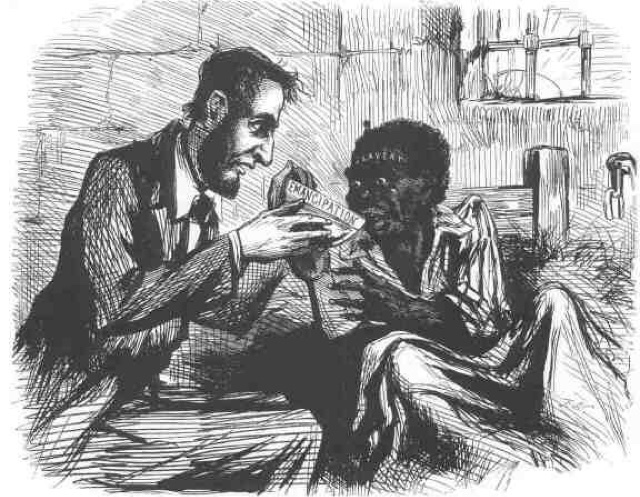 In a time where photography was just starting, and lots of potential voters are either barely literate or speak a language besides English, detailed vivid drawings like those of Nast were the viral media of the 1870s. At the time venal politicians were exploting anti-immigrant sentiment among segments of the American population, sounds a bit familiar. 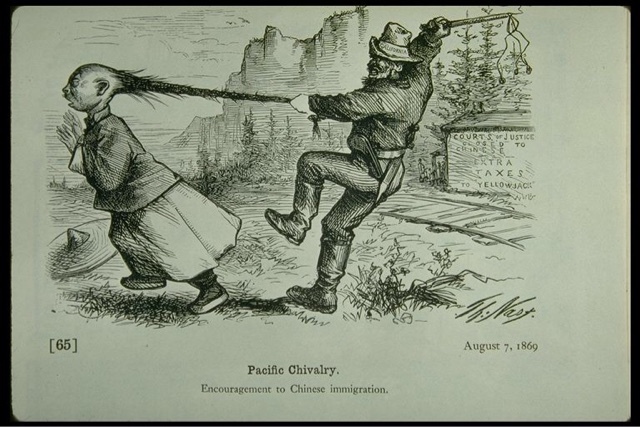 The biggest fear seems to have been that of Chinese railroad laborers who stsyed in the country after the railroads were completed. Nast, an immigrant, was strongly pro immigrant. 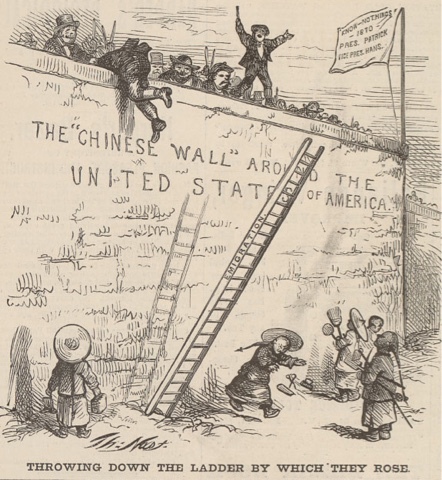 I loved Nast's cartoon making fun of politicians who proposed building a wall to keep out immigrants. 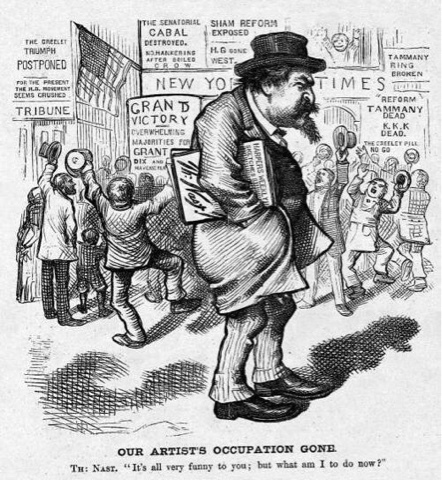 As Nast's cartoons began to increase demands for reform in NYC he was offered large bribes to stop publishing his drawings. To his great credit he refused. Nast was pro-Catholic and anti-slavry. He might have been predjudiced against the Irish. Where your ancestors were from was a very big matter in NYC at the time. Pflueger does a very good job explaining how politics worked at the time. I also learned a lot about the magazine business and the economics of being a cartoonist. Sometimes Nast was very affluent, sometimes he had to scramble to feed his wife and five kids. Nast published drawings not just on political corruption but on slavery and injustice of different sorts. Nast comes across to me as a very good man, proud of his work but able to look at himself with a wry eye. One of his more famous drawings. Nast was a character artist, he exaggerates characteristics to make his points, he relied on stereotyped features to make his drawings vivid. 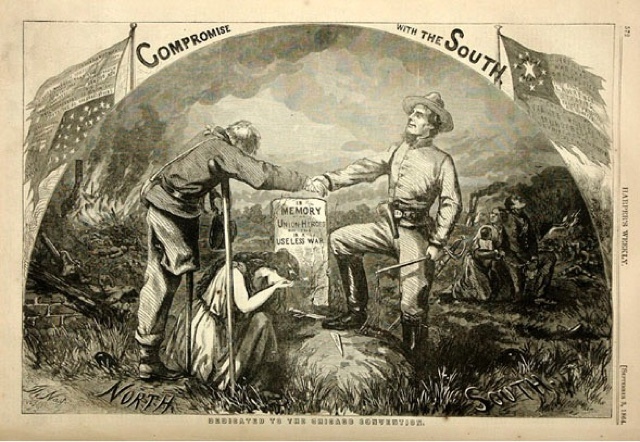 Thomas Nash Political Cartoonist, a young adult biography, taught me a lot about American history. I never knew how important cartoons were. Readable in under two hours, I really enjoyed this book and recommend it to readers at all levels interested in American history. The concerns of Nast are the concerns of America today. I would love to see his cartoons on Trump and his wall! If I had a wish for the book,i would like to see included a chart converting USA money in the time of Nast's life to current money. When Pflueger tells us, for example, that Nash was paid forty dollars a week when he started at Harper's I need a frame of reference for this. On the author's very well done webpage you can learn about how she came to write this book and her other works and interests. David Lehman's introduction begins with a beautiful reading of William Butler Yeats’s poem “The Second Coming", one of my favorite poems. He sees this poetry as a perfect gloss on America. "Turning and turning in the widening gyre The falcon cannot hear the falconer; Things fall apart; the centre cannot hold; Mere anarchy is loosed upon the world, The blood-dimmed tide is loosed, and everywhere The ceremony of innocence is drowned; The best lack all conviction, while the worst Are full of passionate intensity". The guest editor selects the poems. Hirsch talks of how he was impacted by reading 1000s of poems from literary and online publications to select the 75 poems for the 2016 edition. The collection also includes detailed biographies of the authors, they range from established high level writers to those just beginning their careers. Most of the poets make a living as pedagogues, teaching at American universities. Each is given a generous amount of space to talk about how they came to write their included poem, what it means to them. We see writers influenced by belief systems that originated in India thousands of years ago. Some write with great consciousness of the ancient tradition of poetry, exhibiting proudly a deep erudition. Some write in the style made fashionable by the poet of cheap bars and rough streets,Charles Bukowski. Some seem intent on shocking7, others are invoking the catalogues of Whitman. A number of the poems in appearance seem much like short stories. Among the poems i especially liked were JENNIFER GROTZ's "Self-Portrait on the Street of an Unnamed Foreign City". To me it perfectly captured the feeling of wandering the streets in a city nearly unknown to the speaker. "Sentence" by CHRISTOPHER BAKKEN reminds me of something one of Roberto Bolano's Savage Poets might have written. about four decades ago I was an avid reader of his philosophical articles, in tradition of American Pragmatism. RICK BAROT's "Whitman, 1841" is a very moving account of Whitman, focusing on his sexuality. PAULA BOHINCE "Fruits de Mer" treats American counter culturallists in Paris, paying homage at the grave of Jim Morrison as very striking. "The h is quiet. A wafer of breath—just like here. There’s no telling what languishes inside the body. Not mist, but a whole cloud passes into one window, then two hours later, out the other. The American college students try out their kindergarten Hindi: ha-pee-tal, ha-pee-tal. Lips finger the sign’s script, then the United States break open their mouths into sad smiles when they realize it’s not Hindi, but English written in Devanagari: hospital. For the whole day we drive along miles of wet, slithering clay"
I greatly enjoyed this collection. I recommend it without reservations to all lovers of poetry. I,was kindly given a review copy of this book. "For life is practically a battle. To all intents and purposes a battle. Except for a few lucky fellows who can read books, and so avoid the realities." From "The Other Kingdom"
I recently reread one of my favorite short stories, "The Celestial Omnibus". I think it contains deep wisdom about the rewards and pains of a reading life and I hope to keep periodically returning to it until I feel I am ready to take my own celestial omnibus, return tickets are available but not required. 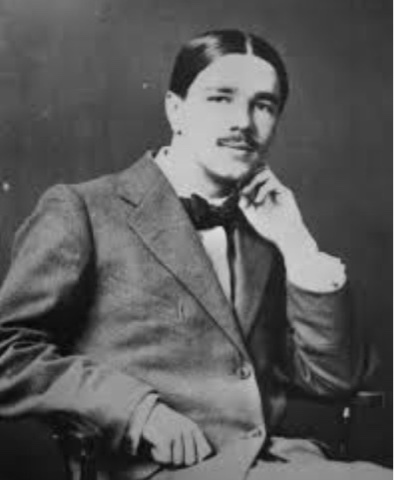 There are lots of blog posts about Forster's novels, I have posted on several of them, but few seem to read his short stories. Of course this is in part due to the sad fact that few read short stories and fewer read 150 year old ones. I decided to read "The Other Kingdom" today because it comes right after "A Celestial Omnibus" in the collection. I started it then and decided to come back to it. As "The Other Kingdom" opens the young Irish bride of an upperclass Englishman is receiving tutoring in Latin. Her husband wants to educate her. I was pondering the meaning of the title, I did a Google search, perhaps it has a meaning in classical Roman literature I do no get or maybe it refers to Ireland. The woman is esthetic when her husband gives her a wood of her very own. The story takes a treacherous turn and I will not spoil it. I think what I liked best about the story were the conversations about the value of studying the classics. I will be, I hope, reading more of his short stories. 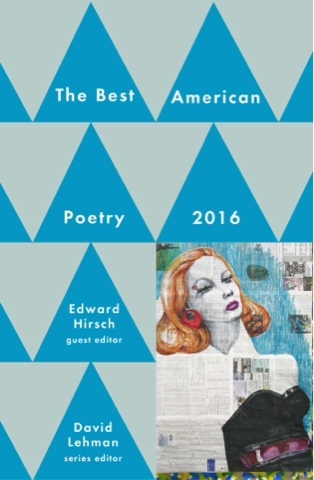 Recently I read what might be the best book on the art of reading I have yet read, How to Read a Poem and Fall in Love With Poetry by Edward Hirsch. (What he says can be largely applied to fiction also). 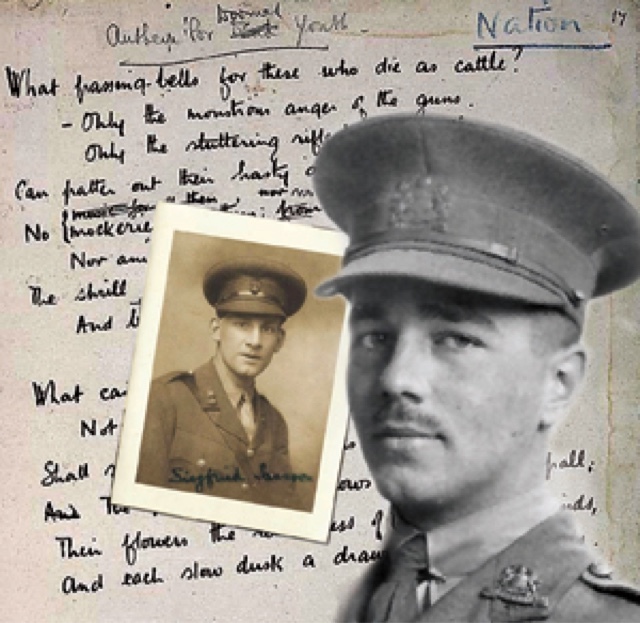 One of the poets he speaks most reverentially about is the English World War One poet, Wilfred Owen. 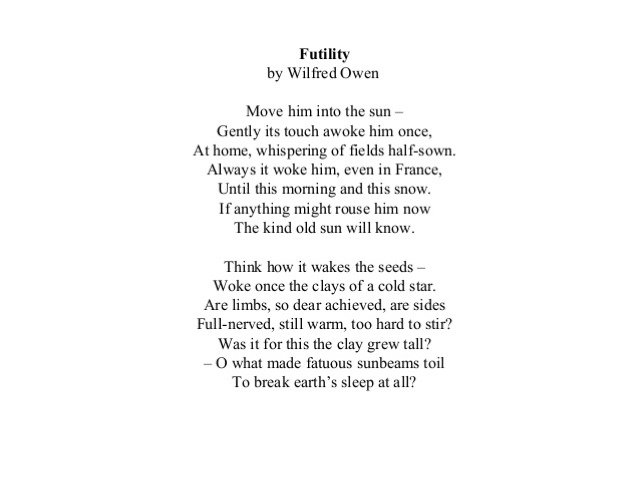 He sees Owen as a poet in the Homeric tradition. 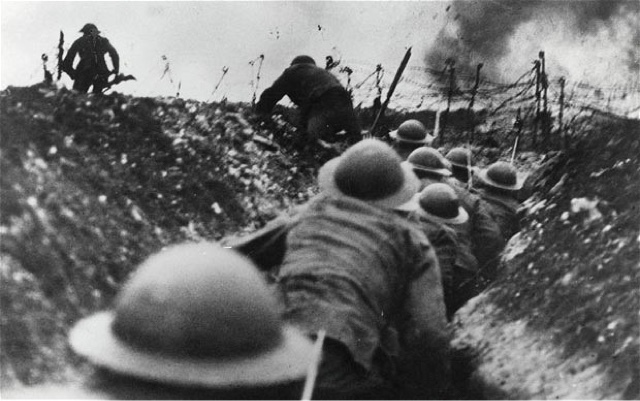 As I read his poems on life and death in the trenches in France I could not help but imagine Achilles, Hector, Odysseus, and Paris listening to a bard recite Owen in silent awe. I was very happy to see Delphi Classics has an E Books of his complete works, including an extensive correspondence, available for $0.99. As I said in my post on Elizabeth Bishop I do not have the technical tools to generalize about poetry collections. His poems about the war, the senseless slaughter of millions of men I felt an oceanic feeling, a sense this is what poetry is about. His more conventional poems are lovely, he was killed at age twenty five, blocked from developing his full powers. 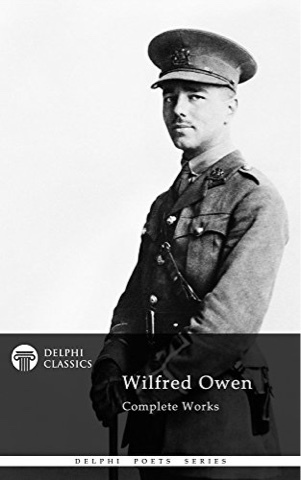 Wilfred Owen was classically educated, a lover of poetry. You can see that and his love for the common "Tommie" fighting for his king in a completely absurd incredibly wasteful war. "Surely to God it wasn’t much to ask, that you get through to the end and looking back you don’t fill with horror and disappointment and hopeless wishful thinking?" - from "In Another Country"
I just read yesterday a 1996 Paris Review interview with the fabulous Mavis Gallant in which she said collections of short stories by one author should not be read straight through as a novel but savored slowly. I know she is right but I find it hard to resist the urge to read through a collection when it is by an author as wonderful as Gallant or David Constantine. "In Another Country", the title story in the very generous collection of his works, is the fourth story by Constantine which I have read and now posted upon. This story centers on a couple mRried fifty years. The husband, eighty, is suffering from cognitive decline and we see how this distresses his wife. As the story opens they are talking about the discovery of the body of a young woman, frozen in the glaziers of Switzerland. We slowly learn the man and discovered woman had a romance when he was twenty. They fled then Nazi Germany hoping to settle in Switzerland. She dies on the way. With the discovery of her body old long dormant wounds are opened. The man, even though he clearly has no ability to do so, feels compelled to claim her body as next of kin. She was pregnant when she died. The couple had no children. This is a beautiful if heartbreaking story about growing old, about a very long marriage. I will remember it I hope for a long time. As of today I have 163 short story books on my E reader, thousands of stories. Most of these books I have been given. Right now I am reading more or less straight through, contrary to Mavis Gallant's advise, a collection of her stories and one of forty stories by Anne Beattie. I will mostly journalize my reading experience. Other than posts on Indian and Filipino short stories, short story posts draw little readership. Born in Salford in 1944, David Constantine worked for thirty years as a university teacher of German language and literature. He has published several volumes of poetry, most recently, Nine Fathom Deep (2009). He is a translator of Hölderlin, Brecht, Goethe, Kleist, Michaux and Jaccottet. In 2003 his translation of Hans Magnus Enzensberger’s Lighter than Air won the Corneliu M Popescu Prize for European Poetry Translation. His translation of Goethe’s Faust, Part I was published by Penguin in 2005; Part II in April 2009. David's four short story collections are Back at the Spike, the highly acclaimed Under the Dam (Comma, 2005), The Shieling (Comma, 2009), which was shortlisted for the 2010 Frank O’Connor International Short Story Award, and Tea at the Midland (Comma 2012). 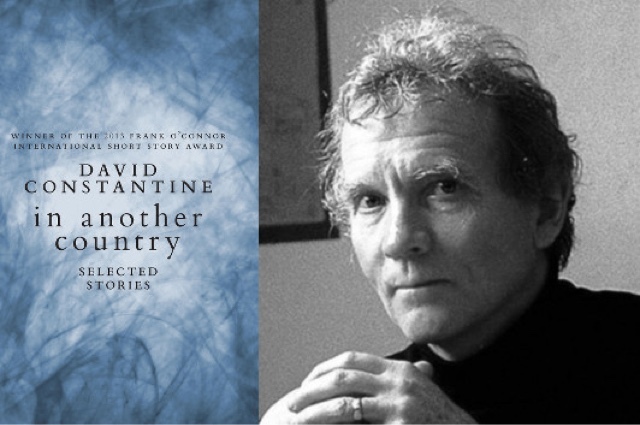 Constantine’s story ‘Tea at the Midland’ won the BBC National Short Story Award 2010, and the collection as a whole won the Frank O'Connor International Short Story Award in 2013. I recently read one of the most inspirational books about the art of reading I have ever encountered, How to Read A Poem and Fall in Love with Poetry by Edward Hirsch. 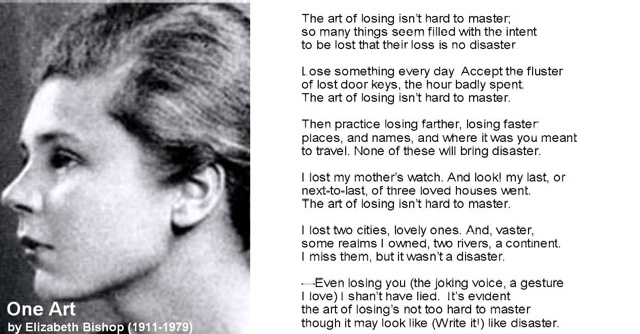 He devoted a lot of space and greatly admired the work of an American poet, Elizabeth Bishop. Based on the poems he quotes and talks about I decided to read a complete edition of her work, Poems. 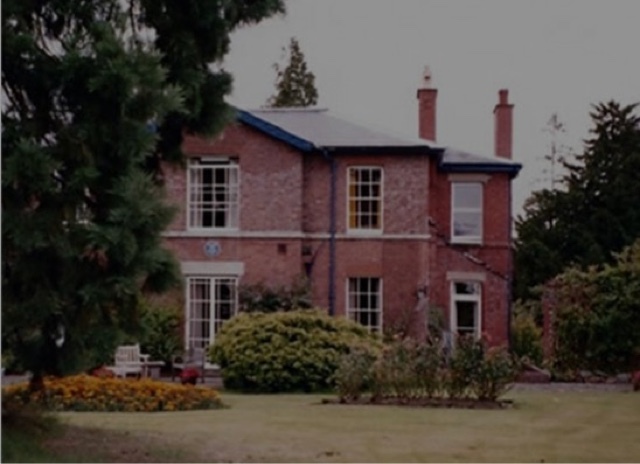 It includes work from 1934 up until her final year, 1979. I felt a kinship with Bishop through our mutual admiration of the great Brazilian writer Clarice Lispector. Bishop also loved Brazil and I knew a number of poems centering on Brazil were in the collection. I do not possess the tools to write a post on a poetry collection. I loved many of the poems but not all. 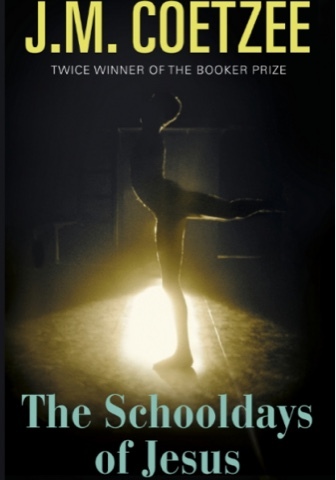 The Schooldays of Jesus by J. M. Coetzee is a sequel to The Childhood of Jesus, which I have not yet read. The Schooldays of Jesus is set in a Spanish speaking country, probably in the 1930s. The only book mentioned is Don Quixote and there is political unrest similar to that of the period of the Spanish Civil War. My reading of the book was very much influenced by the title, I wondered if we were seeing in the life of the young man David an allegory of the missing years of the historical Jesus. David is maybe seven when the story begins, he is being taken care of by a couple, not his bilogical parents who are on the reasons we never quite understand running from the authorities. The couple ends up working as farm laborers on an establishment owned by three sisters. David enjoys the freedom of the field, often in the company of his dog Bolivar. (I just now wondered if this could be an allusion to the great liberator, putting another twist on the allegory.). The three sisters agree to sponser the schooling of David at an academy that primarily teaches dance but also deals in numerological matters. The boy gradually learns things about life, the adult world. The couple, whose bond never seemed strong, drift apart. The woman starts working at a shop, the man begins to deliver advertising leaflets. There are several interesting plot developments. There is much to think about. I was kindly given a review copy of this book. I found it fascinating and am very glad I had the opportunity to read The School Days of Jesus. J.M. Coetzee's work includes Waiting for the Barbarians, Life & Times of Michael K, Foe, and Slow Man, among others. He has been awarded many prizes, including the Booker Prize (twice). In 2003, he received the Nobel Prize for Literature. My thanks to Max u for the provision of an Amazon Gift Card which allowed me to acquire this book. 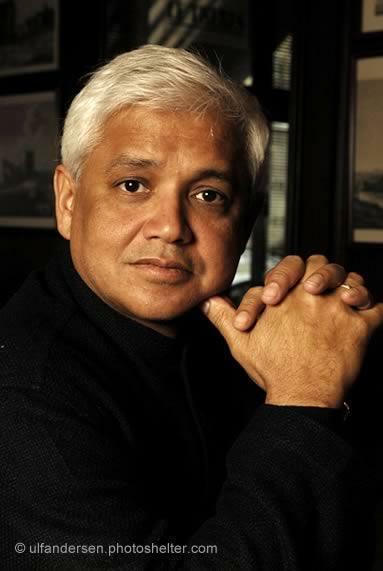 A few years ago I read, really liked and posted upon the first two installments of Amitav Ghosh's Ibis Trilogy, The Sea of Poppies and The River of Smoke. The final book in the trilogy Flood of Fire came out earlier this year. I want to read it for sure but I will wait until the price drops from $14.95, which is too high for an E Book of a novel. 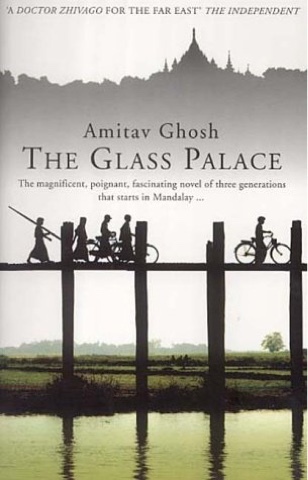 I did not really have any plans concerning reading more of the works of Ghosh until I received notice that his set in Burma historical novel, The Glass Palace, covering the period around 1890 to 1990 was temporarily marked down from $11.95 to $1.95. I like historical fiction set in South and South East Asia and I felt this would be a good book so I acquired it. I was right. It certainly was. The book reminded me of the just published masterwork by Anne Proux, Barkskin in that it is very much about the logging industry, in this case Burmese teak, and is a multi-generational family saga. As the story opens, our lead character is a deck hand on a riverboat. The boat is badly damaged and the young man, maybe fiveteen, is told to go ashore and find work for the thirty days it takes to repair the boat. He is an Indian, looked down upon by many Burmese and is directed to a food shop of an Indian lady who hires him and gives him a place to live. He decides to stay on and he meets a man who will change his life and play a big role in his future. He will become the father he never had. There is a lot of very interesting material in The Glass Palace about the teak logging industry. In one fascinating and quite gruesome section we learn how anthrax impacts and ultimately kills elephants. Moving the huge logs down river is hard dangerous work. We learn a good bit about the Burmese royal family, displaced by the British and sent into exhile in India when the British take over. India soldiers serving in the British army play a big role in the story. Indians see this as a mark of family honor but the Burmese see them as contemible slaves set to be kill for the English. There are a lot of personal entanglements and romances in the novel, sometimes they worked, sometimes they did not. The segments involving war against the Japanese were very exciting. endorse this book.especially if you can get it for $1.95.